Evite las molestias de negociar el sistema de transporte público de Chengdu con este tour privado guiado de puerta a puerta por el Buda gigante de 233 pies (71 metros), declarado Patrimonio de la Humanidad por la UNESCO. Viaja en tren bala y vehículo privado, pasea por el poderoso Buda y disfruta de un almuerzo tradicional de Sichuan y una sesión de mahjong en una casa de té. Disfrute de los traslados de ida y vuelta de ida y vuelta en tren bala y vehículo privado. This is our 4th time to book Viator other 2 with my wife's account, but am disappointed with this booking. My 2 daughters were the ones who went with the tour and the feedback was not good. The tour guide that was given to them was Sky. She was nice and funny , and young, like same age as my daughters 21/23 but seems like it was her first time to go to Leshan also. My daughters were picked up early, at 7:30 am, and had to wait a long time at the train station because the train was scheduled to leave at 9am. 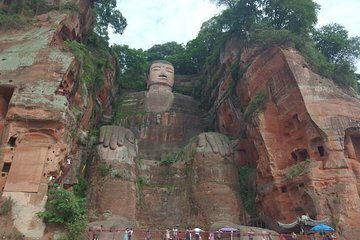 Then upon reaching Leshan, they only went to see the Buddha and didn't do or see anything else. Since there was nothing else to do after seeing the Buddha, they had to leave early and take the bus, a 2 hour bus ride. Such a waste of time and money for us. If I only knew, we could have bought the train tickets ourselves. I would not recommend this tour. It was a well organized and indeed interesting visit to the histrocial site of the Giant Buddha. Our VERY experienced guide FIONA told us a lot during the trip from Chengdu to Leshan. We had to wait for more than an hour to make the way down to the bank of river, since there is always somthing happening around you, time is just passing.....look around and enjoy! It was really crowded but our guide managed to take us to a small local restrauant for lunch in due time. Thank you FIONA for a very very interesting and funny day.